Acquiring an all-time high grade of “Excellent A+,” the Galaxy Note8 exceeded the display performance of the Galaxy S8 and previous Galaxy Note device in the main assessment categories including brightness, outdoor visibility and color gamut, once again raising the standard for smartphone displays. “The display on the Galaxy Note8 has not only major improvements in the OLED display hardware, but also many new and enhanced display features and display functions,” DisplayMate reported. Read on to learn about which were most praised by the industry’s leading screen authority. The Infinity Display of the Galaxy Note8 boasts a record high peak brightness of 1,240 nits* – a 22 percent increase from the Galaxy S8 – and a screen reflectance level of 4.6 percent, one of the lowest that DisplayMate has ever measured for a smartphone. Combined high brightness and low screen reflectance levels equate to a display that is easily readable, even under relatively high ambient lighting, such as bright sunlight. 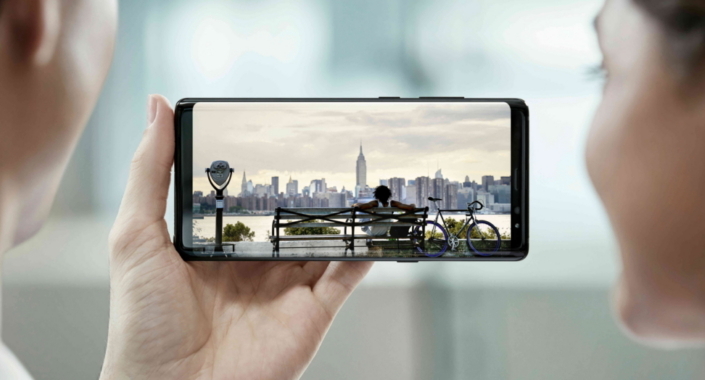 As a result of its larger display size and larger aspect ratio of 18.5:9, the Galaxy Note8 is the first Note smartphone to realize 3K QHD+ (2960×1440 pixels) resolution. The display has Diamond Pixels and sub-pixel rendering with 521 pixels per inch (ppi), providing significantly higher image sharpness than can be resolved with normal 20/20 vision at the typical viewing distance of 10 inches or more, so the display appears perfectly sharp. The Galaxy Note8 is certified by the UHD Alliance for MOBILE HDR PREMIUM™, which allows it to play the same 4K High Dynamic Range content produced for 4K UHD Premium TVs. To do so, the Galaxy Note8 has the required Digital Cinema DCI-P3 wide color gamut, perfect blacks and an infinite contrast ratio, as well as a peak brightness level of more than 1,000 nits which is needed for High Dynamic Range. Furthermore, its built-in video processor allows it to provide an expanded dynamic range for standard video content that produces an HDR-like effect. The native color gamut of the Galaxy Note8, meanwhile, is even larger than that of the Galaxy S8 – 112 percent of DCI-P3 and 141 percent of sRGB. In other words, users can enjoy movies and games in the colors that the content producers intended. The DisplayMate evaluation had many positive points to add about the design of the bezel-less Infinity Display of the Galaxy Note8, which fills almost the entire front face of the phone from edge-to-edge. The report noted that its 6.3-inch display is 20 percent larger in screen area than the Galaxy S8 and 14 percent larger than previous Galaxy Note displays, despite the fact that the size of the phone itself did not increase. The dual-curved screen OLED display is manufactured on a flexible plastic substrate so that it can bend around corners on both sides of the phone to not only minimize bezels, but also provide two curved Edge screen displays that can be viewed and controlled from both the front or the sides. The display’s expanded screen space, along with its new 18.5:9 aspect ratio, explained DisplayMate, enhances the utility of the device, making it easier for users to multitask, watch video content and check notifications. Furthermore, the adoption of a new Night Mode with a blue light filter allows users to adjust and reduce the amount of blue light from the display for better night viewing and improved sleep. The Galaxy Note8 will be available in stores beginning September 15. * With Automatic Brightness On, the Galaxy Note8 peak brightness reaches 1,240 nits.